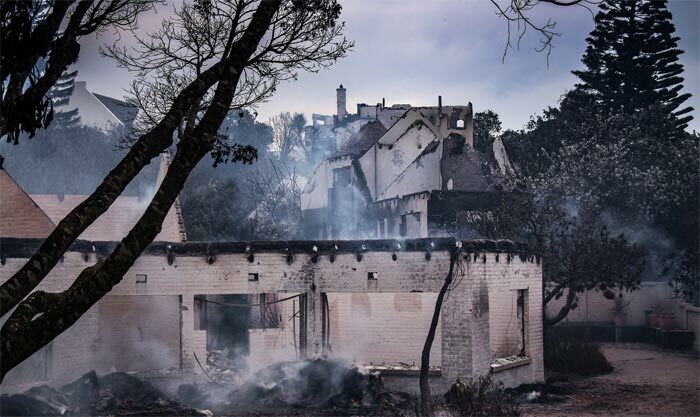 THERE is a high probability that arson was to blame for the fires which razed ten houses and severely damaged three more at St Francis Bay on 18 December 2018. The first fire broke out near the waste site at Sea Vista and was reported to Kouga’s Fire Department at 10:45am. “It can safely be assumed that fire no 2 was set deliberately and with malicious intent in an extreme gusting westerly wind. The puffs of smoke could also indicate the use of some sort of flammable liquid,” the assessors found. “Although it could be possible that fire no 3 was started from flying embers from fire no 2, such an assumption is not consistent with the wind direction at fire no 2 at the time,” the report states. The assessors further praised the manner in which Kouga and other roleplayers rallied together to fight the fire. Kouga Mayor Horatio Hendricks said the police investigation into the suspected arson was ongoing. My question of December 18 again: Must we now live in fear?